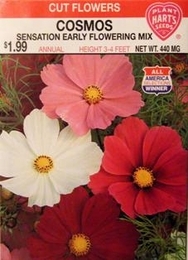 Cosmos reach the height of their beauty in the Autumn when they become one of the dominant flowers in the garden. Given plenty of room, the tall plants branch freely producing abundant flowers. Heat and drought resistant. Excellent in large beds as well as for cutting. Continues to flower until frost if flowers are kept picked. Does well in any sunny location. Thinning - when plants are 3 inches tall thin to 12-24 inches apart.